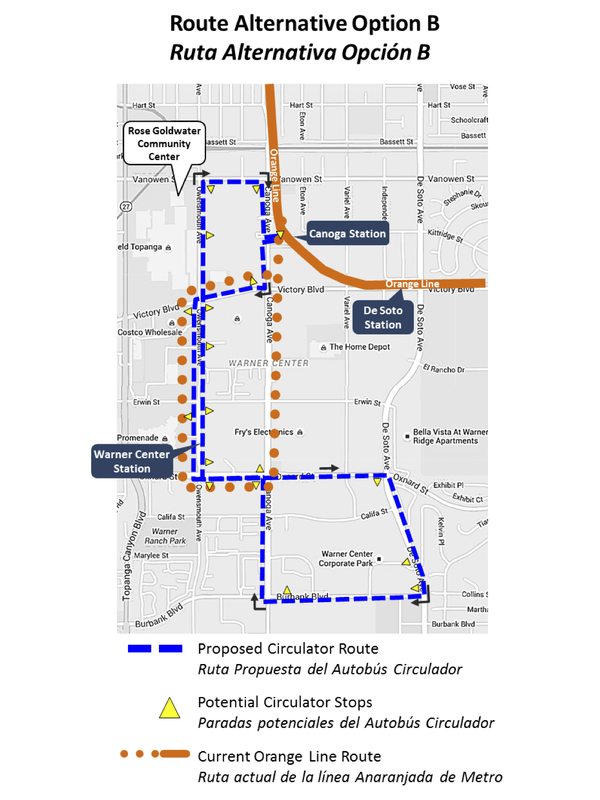 A public hearing will be held Wednesday, May 3, for a proposed change to the Orange Line: discontinuing running direct Orange Line service to Warner Center and replacing it with a Warner Center shuttle that would make multiple stops and offer transfers to the Orange Line at Canoga Station. The change, if adopted, would begin in December or later. Maps of the two proposed shuttle bus routes are above. The shuttle will provide expanded opportunities for employees, residences and businesses to better access the Orange Line. Between North Hollywood and Chatsworth Stations, service will continue to operate every eight minutes during peak travel periods. Some Orange Line bus trips from NoHo will be turned back at the Reseda Station, with service still provided every four minutes in this segment, which is the busiest on the line in terms of ridership. This is a chance for you to voice your opinion on this change! The public hearing will be held on Wednesday, May 3, at 6:30 p.m. at the Rose Goldwater Community Center, 6600 Topanga Canyon Boulevard, Canoga Park, CA 91303 (Northeast corner of Westfield Topanga at the intersection of Vanowen and Owensmouth. Comments via e-mail should be addressed to: servicechanges@metro.net. Subject line: December 2017 Service Changes. Comments via U.S. Mail should be addressed to: Metro Customer Relations, Attn: December 2017 Service Changes, One Gateway Plaza, 99-PL-4, Los Angeles, CA 90012-2932. Facsimiles should be addressed as above and sent to 213-922-6988. The deadline for comments is 11:59 p.m., Saturday, May 6. ADA REQUIREMENTS: Upon request, sign language interpretation, materials in alternative formats and other accommodations are available to the public for MTA sponsored meetings and events. LIMITED ENGLISH PROFICIENCY: Upon request, interpreters are available to the public for MTA sponsored meetings and events. Agendas and minutes will also be made available in other languages upon request. All requests for reasonable accommodations, interpretation services and materials in other languages must be made at least three working days (72 hours) in advance of the scheduled meeting date. Please submit requests by calling (213) 922-4600 between 8 a.m. and 5 p.m., Monday through Friday. Our TDD line is (800) 252-9040. Individuals with hearing or speech impairment may use California Relay Service 711 + Metro phone number. this is a complicated one. how about people that take metrolink then ride the shuttle into Warner center for work? will they need to transfer? seems like a hassle. the bus going through Warner center is also a hassle when trying to get to chatsworth quickly from… say, pierce college to the metrolink station to get back home in the few metrolink outbound trains to Ventura county. its going to be interesting to see what the scheduling looks like. Excellent point. 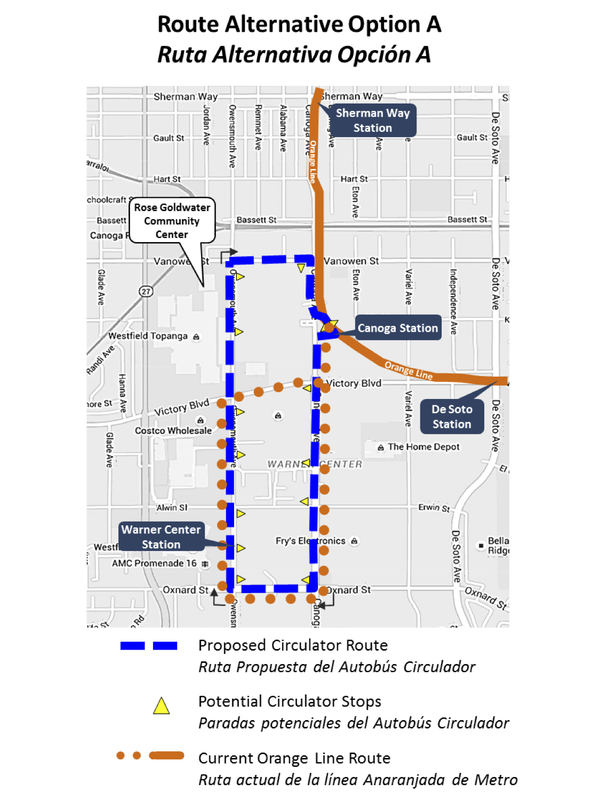 Metro should, at least during peak periods, run through service between Chatsworh and Warner Center via the busway. alternately, metro could simply eliminate the Noho-Warner Center through service, keeping the existing main line and Chatsworth-Warner Center services (hopefully with increased frequency). Route 245 topanga canyon directly connects chathsworth and the warner center. The only “fly in the ointment” is the prospect of 16-minute midday and weekend headways on both lines, This is a 100% sure way to lose passengers. Instead, headways should be in multiples of 3, not 4, with 3-minute peak service east of Reseda, etc. Same with the Red and Purple Lines. In fact, ALL rail and major bus lines, especially Metro Rapid, headways should be in multiples of 3, meaning that most patrons may not even need a hard copy of the schedule. In New York, I suspect that most subway riders never have need for a printed schedule, even though they are posted online. With buses the problem is bunching. When you run services too frequently, you end up with them bunching together. So you have a dead period of 5-7 minutes and then 3 buses arrive, half of them empty. In both cases the other problem is funding. It costs over a hundred dollars an hour to operate a bus/light rail vehicle and when you add those up across an area the size of LA, with so many routes, you get hundreds of millions of dollars. Measure M should provide some additional funds for operations this summer so hopefully the most heavily used routes can have a few more buses running them. If the operating costs per hour are approximately the same for buses and trains, then this means that the operation costs PER PASSENGER MILE are considerably less for rail than for buses. Trains are generally faster than buses and carry several times more passengers per trip. That fact, and the problem of “bunching,” are the best reasons for rail over bus on any route. This also argues for perhaps replacing those full-sized bus lines with hourly headways with something cheaper. However, I do not know enough to suggest an alternative. Maybe some variation of on-call service could be cheaper such as that employed by shared-ride airport vans. The headway should blend with the orange line headway to enable timed transfers at canola station. It’s important to include in the messaging about this proposal that the shuttle would be included in the transfer period for a TAP card. Also, there were no details provided about the frequency of the shuttle – only the Orange Line. The frequency of the shuttle matters – if it runs substantially less often than the Orange Line, this will seriously deter riders. Transferring from something very frequent to a last-mile shuttle that is very infrequent is exceptionally frustrating. Pardon my French, but why the hell aren’t there crossing gates on the Orange Line? A month or so ago, a car making quick right turn pulled in front of the rapid bus and almost got broadsided — and it was a Sunday! Not just safety, but iot would speed up travel immensely. We are. An environmental report is currently being prepared to add crossing gates along the orange line and up to 5 flyovers for the busiest intersections. These improvements look to shave 15 minutes on the end to tend travel time while dramatically improving safety. Sadly it is a bit of a rationing of resources after looking at the ridership of the line in operation. The line is far more heavily used east of Reseda. Accordingly there will be massive investment in infrastructure, service and quality on the Orange line east of Reseda. There will be some service cuts on the Orange line west of Reseda. Honestly the orange line is the best line currently in the system because of it’s frequency. Why mess with something that works. It sounds like things will get worse? The winning formula for transit lines is frequency. All the other lines run too infrequently. IN MY OPINION ITS A GOOD IDEA HOWEVER THE LA METRO IS FORGETTING INTO THE ACCOUNTABILITY OF THE UNDOCUMENTED COMMUNITY MOST OF THEM HUNDRES WORK IN LOS ANGELES HOOLLYWOOD AND OTHE LA AREAS HOWEVER THEY RESIDE IN THE VALLEY MOST OF THEM GET OUT FROM WORK AT 10 11 OR EVEN AT 12 AM MIDNIGHT WILL THIS ROUTE? BE OPEN AND WORKING AT THOSE TIMES?